Preparation precedes presentation and elevation, a principle often taught to the young men of the Omega Lamplighters program. When an unexpected opportunity presented itself, the Lamplighters step team (known as the Light Team) were charged up and ready to shine. 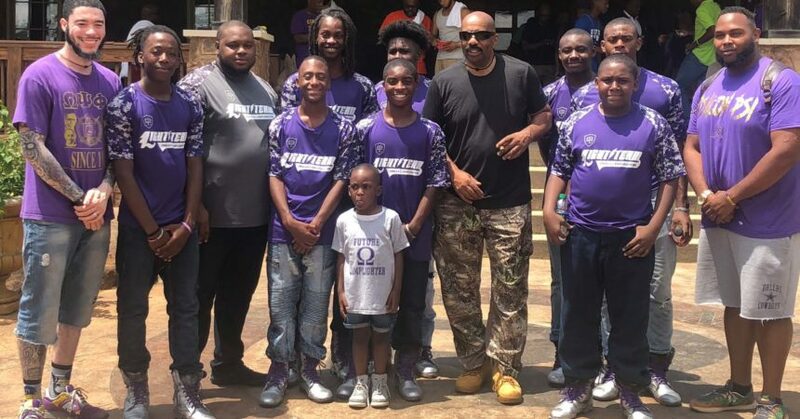 The stage was Steve Harvey’s, annual mentoring camp for fatherless, at risk, teenage males ages 13 – 18. This year is the 10th anniversary, Harvey decided to introduce a new element to the four-day camp by inviting the Light Team to come perform for the campers. The Steve Harvey Mentoring Program (SHMP) is designed to share and teach the principles of manhood. The mentoring program helps young men realize their potential and prepare them for a strong productive future. The program’s goals are educational enrichment, one-on-one mentoring, and cultural awareness. The aim is to break the misguided traits of manhood and introduce positive role models who counter images of toxic masculinity. “When we found out we were going, I was like cool, but on the inside, I was running all around with excitement,” said McKinley Wilson, a rising senior at Rickards High School and Omega Lamplighters Chaplain. 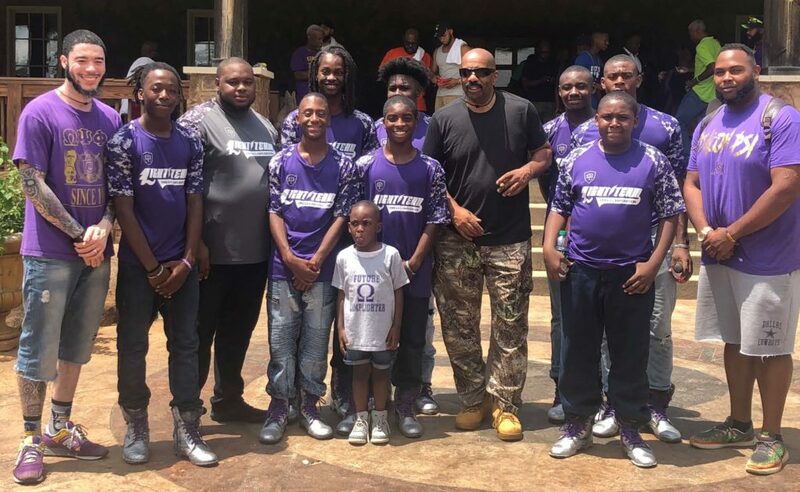 The Founder and Director of the Omega Lamplighters Royle King II were among the group of more than 30 volunteer counselors from Omega Psi Phi Fraternity, Incorporated who donated their time during Father’s Day weekend to help mentor and uplift the next generation. The three-minute performance came during a restroom break so many of the campers were up around and moving. This made the performance a bit more challenging for the steppers as they had to get everyone back into the room seated and quiet. However, this challenge provided the boys with an excellent opportunity to practice the leadership principles that they work on diligently during various workshops. When the Light Team commanded the stage, everyone around stopped what they were doing to grab a seat and take out their cameras. The Lamplighters received a standing ovation from more than 200 campers. After their performance, they were shocked to greet and shake hands with Harvey who praised their performance and encouraged them to continue to be positive examples. In addition to the performance by the Lamplighters, a few Tallahassee Omega men attended as volunteer counselors. Royle King II and Brandon Williams of the Chi Omega chapter of Omega Psi Phi Fraternity, Incorporated, and Jamal Noble of Florida A&M University’s Upsilon Psi Chapter of Omega Psi Phi Fraternity Incorporated were in attendance. The Omega Lamplighters are accomplishing what they set out to do, establish brotherhood, exemplify excellence, maintain commendable grades (the average GPA for the Light Team is a 3.5), and share with others the numerous benefits they have received. Their performance and the impact it had on those in attendance shows that these young men are out to change the narrative, one opportunity at a time.